The cold weather is undeniably upon us, for better or worse. With the winter, unfortunately, comes winter weight. We’ve all been in the situation where we are suddenly 10 or more pounds heavier by first snowfall! Humans have the luxury of going to a nice warm gym in order to shed those extra LBs. 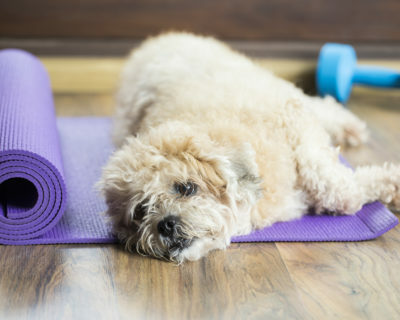 Your dog, however, is not so lucky, he or she can fall prey to that extra winter weight just like you and sadly they can’t drive over to the gym for a quick work out. So, what can you do, other than limiting their food, to help your pooch get ready for swimsuit season? Why worry about my dog’s weight? Before you focus on how let’s take a moment to consider why. We know the risks of obesity in humans, increased risk of heart diseases, diabetes, labored breathing, etc. However, it’s easy to gloss over the risks to your dog’s health when they pack on the pounds. More than 45% of dogs can be classified as obese and those extra pounds can create an issue for your dog. That extra weight could lead to them overheating in the warmer months, put extra strain on their hips and joints, make breathing harder, and may even increase their risk of liver disease and cancer. This method works great since you are already looking to keep Fido out of the cold! There are tons of games you can play in the home to help your dog get in some much-needed exercise! Games like tug-of-war with your dog can get their heart pumping and their mind and muscles fired up! It might seem simple but the act of your dog having to pull against you can burn some serious calories! Just make sure that you can pull with enough force and your dog doesn’t drag you down with the rope! Setting up indoor obstacle courses can be a nice challenge for your dog if you have the space to do so. Couch cushions, old boxes, and coffee tables can easily make a maze for your dog to navigate or obstacles to jump over. The important thing is that you encourage them and get them to see it as a game, and of course not to reward them with too many treats which would defeat the purpose. Despite your mother’s warnings not to play ball in the house a small game of fetch is a sure-fire way to get a dog of any shape and size up and at ‘em! Just make sure to move anything breakable out of the line of fire and of course to throw gently! Treadmills aren’t just for busy humans! Whether you bought one because you enjoy exercise or because you made a failed New Year’s Resolution a treadmill in the home can be a boon to your dog as well! It can be easy to think of Treadmills as a strictly human device, but that is luckily not the case. Many dogs can be trained to use an electric treadmill and may even enjoy doing so! Just make sure to take it slow, both in introducing them to it and initial speeds on the treadmill. Don’t force your dog onto it if they are scared by the noise and moving track. It’s also important to monitor your dog while they are on the treadmill. You can do it by simply standing next to the track while your dog is on it or even by putting them on their leash! Just like a human, there can be a risk of injury if they fall and hit the track or if they slip off the treadmill. If you find that your dog can’t get their full gait on a treadmill many companies make dog specific treadmills that for larger dogs can give the ability to really move! Just make sure your dog doesn’t become a treadmill hog if you want to keep using it yourself. Now I know what you’re thinking “giving dogs treats is how I got into this mess!” And while you’re not wrong it’s more about HOW you give your dog treats. There are multiple ways to go about making treats more difficult for your canine companion. One of the tried and true ways is, of course, making your dog execute one or several commands before you give it to them. Rolling over and playing dead are cute and seem like they are only playing, but it burns calories! Make sure to keep your dog’s interest and to not tease them with the promise of a treat and then not give it to them. After all, you’d hate the promise of a slice of cake that never comes, right? You can also purchase and use toys and puzzles designed to make your dog work for a treat. Some are as simple as a ball filled with treats that has a small hole which causes treats to fall out when hit. Others are as complicated as small puzzles that your dog needs to slide or flip in order to get the tasty snack inside! Either way, the key is to make sure your dog doesn’t abuse the system and get more treats than they should! Take a trip to the store with your dog! Lucky for all of us pet owners the world seems to be getting ever more pet-friendly. 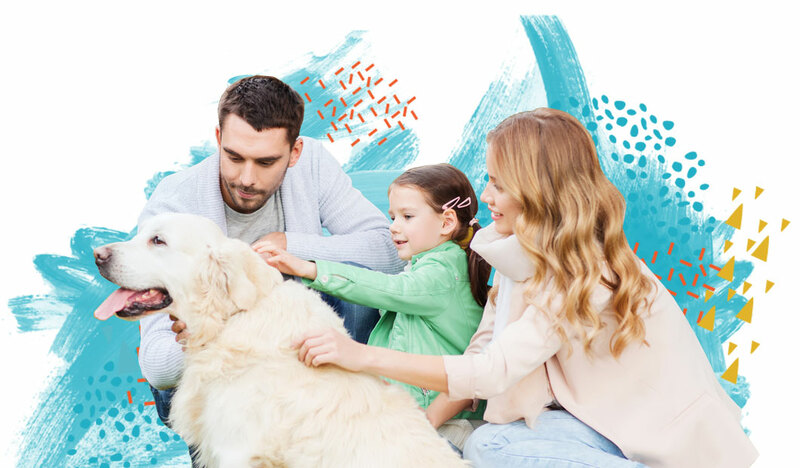 Which means you can take rover over to any number of large national retailers that have pet-friendly policies! Locations like Home Depot and Tractor Supply Co have made their policy very public and don’t mind you taking your dog in for a walk when old man winter comes to town. The list doesn’t stop at DIY shops though you can find tons of different shops that will allow your dog to make an appearance, from bookstores like Barnes and Nobles to hobby stores such as Michaels and even a few clothing stores, like Old Navy and Banana Republic just to name a few! What’s important to note about this method though is that while a chain’s national policy may be to let dogs in the store the stores individual policy may be different! The best practice is to call ahead the first time you want to bring your dog along for errands. Also, make sure to keep your dog on a leash and out of other shopper’s way, they have the right to shop in peace after all. Fair warning though if your dog is extra cute, and let’s be honest they probably are, expect people to want to pet them! At the end of the day, pet weight loss in Winter is just as tricky as human weight loss. It’s all too easy to cuddle up under a blanket and take a nap instead of exercising. But it’s important for you to be that motivator for your pooch! Find out what works for your dog during the cold months and keep at it. Help them shed the pounds and have a lot of fun in the process!